I'm a few days late on this, but the current incarnation of the Carnival of Education is up and running this week over at I Want to Teach Forever (Why do I want to shout, "FAME!" after that?). Check out all the great posts and articles that Tom compiled from the interwebs. My room is cold. I'm sure I've said that before, but let me just say it again. It's cold. Pretty nearly everyone who walks in there immediately comments that it's freezing in there. I happen to like it. But today, when I noticed that several short-sleeved kids were shivering, I felt compelled to comment that this was the THIRD day of school and that it really shouldn't be a surprise to anyone that my room is still cold. Many of the kids have brought a sweater or coat, but a few haven't seemed to catch on. So I asked the class, "You've been here 3 days now; how many days is it going to take before you realize that it's cold and that you need to bring a sweater?" The boy closest to me immediately replied, "About 100 days." And that just about sums up the thinking skills of my kids this year. I did have another funny moment today at lunchtime. I was sitting next to one of my kids and we started talking about the new Wal-Mart that opened near his apartment. He told me that he loved to go there to buy chips and soda. When I asked him where he had gotten all of the money to buy these things, he told me that he does chores and his parents pay him. "I've been working for money all my life," he told me. Yes, the first day is over, and as usual, nothing was usual. Here are a few quick hits from the first day. 1) Our morning announcements are now at 9:00, at which time a couple of 5th graders who apparently had just drunk 15 cups of coffee tore through the pledges, and then we were given permission to begin our instructional day. I love how 8:15-9:00 is considered separate from the "instructional day." 2) We have the last lunch this year (12:45) and the cafeteria actually RAN. OUT. OF. FOOD. While some would see it as a blessing not to be given a "burrito," it was really sad to see the last 10 or so kids in line standing there forever while the cafeteria staff scrambled to find a few peanut butter sandwiches and carrot and humus platters. 2.5) When another teacher and I began asking kids who had not touched their burritos if they would give them up, the surrounding kids (who had already eaten one death bomb burrito) started waving and shouting that they wanted another. 3) One kid in my class can barely write his name. He couldn't do much else. 4) It's cold in my room. I know this. I accept this. The kids, however, seem to think that if they say, "It's very cold in here" enough times, the temperature will magically adjust to their desire. One girl must have muttered that phrase 15 times. 5) At 1:53, we were asked by PA to "write all of your students' names on a piece of paper" to send to the office. Somehow, the technology used to print off class rosters for teachers this morning vanished or was made unavailable for office use later in the day. Oh, and we were asked to send it to the office by 2:00. 6) After passing out glue sticks to the kids, I noticed one kid putting the glue under his nose and inhaling deeply. After redirecting him, I quietly added, "Looks like I picked the wrong week to quit sniffing glue." 7) If it's possible, the bus situation is even more screwed up than last year. There are two "blue" buses, and they were in the wrong order this afternoon. In addition, they both thought they were going to the same apartments and kept sending kids back and forth to each other. *8.5) This was the one hopeful sign of the day, as most of the rest of it makes me feel that most of these kids are VERY low. We're talking sixth-round-limbo-stick low. 9) After PE, my second class came into the room and ALL needed to use the bathroom. But we can't take whole-class bathroom breaks anymore this year, so I had to send them a few at a time and work around the gaps. 10) One boy looked at my picture ID badge and said, "Is that a picture of you when you were young?" a) met my new kids and had a great day getting to know them. b) flopped through my lesson plans and barely survived the day. c) gone stark raving mad and run, mouth foaming, up and down the hallways shouting, "The British are coming!" Ideally, the first day will go smoothly with few or no issues. I'll report back on that tomorrow. To get a paperback copy, go here. To get a Kindle copy, go here. If you're in the UK, go here. To get the Nook copy, go here. To see a funny Batman dog video, go here. And thank you to everyone else who has or who will spread the word about the new book release! 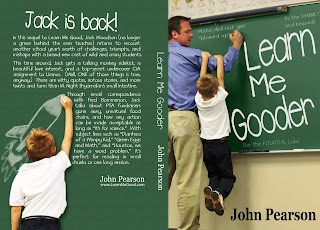 Only 4 more days till Learn Me Gooder hits the (virtual) shelves!! YAY!! My principal never did give me approval to post my flier above the sign-in clock in the office, so I taped it to the refrigerator door in the teacher's lounge. I'm not sure that many people have seen it, because not a lot of my coworkers have mentioned that they'd like to order a copy (not that they necessarily would even if the flier was staring them in the face). Still, I'm excited that it'll only be a few more days! In the meantime, my classroom still is nowhere near ready (though I am LOVING the "freezer room"). I have all day tomorrow to get things in shape, and I'll probably need the whole day. Tonight, I was at the school till 7, with the last 3 hours being Meet the Teacher Night. Last year, we didn't have much of a turnout, so I was able to use most of that time to continue working on my room. This year, though, we had a near-steady flow of parents and kids come talk to us. My new partner taught 2nd grade last year, so he knows a lot of these kids, and he said that we have a whole lot of low academic students. Oh well. Nowhere to go but up, right? OK, it's really just one of many countdowns, but there's no cool techno-cheesy song with that title. 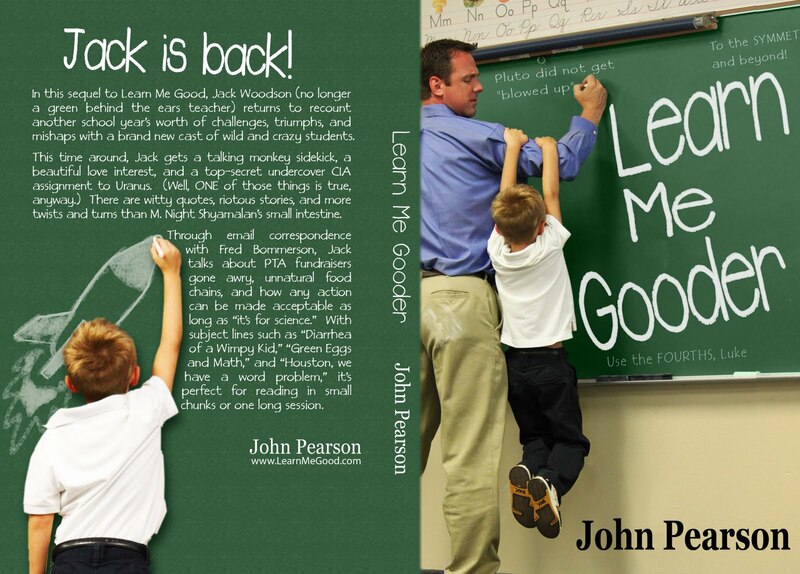 We're only ONE WEEK away from the release date of Learn Me Gooder!! Can I get a WHOOP, WHOOP? Of course, we're only one week away from the first day of school, as well. Can I get a D'OH, D'OH? The kids don't show up for another week, but today is actually the first day back to school for most of us, as our week of staff development begins. Here's hoping I will have plenty of time to work in my classroom, as I've been moved (along with most of the rest of the school). This will be my 5th classroom in 9 years, and I will be working with my 7th partner in that time. Geez, do I stink or something? In hindsight, I probably should have started weaning myself off of the 2am bedtimes a few weeks ago, but it's too late for that now. Here's to a great beginning of the 2011-2012 school year to everybody out there! Here it is! The final cover, front and back! My special effects wizard was able to turn the chalkboard green! I have been very lax in posting this summer, and as such, I have not participated in any Carnivals of Education. However, that hasn't stopped Carol of Bellringers from posting them anyway. Check out the latest one here. Hopefully, I'll have something to contribute for the next one. I received the following email the other day from Mary Richman of School Family Media. I think it's a great idea, and I've signed up for it myself. I invite all teachers reading this to sign up as well. Even though we’re in a summer state of mind, ‘back to school’ season will be here soon! As you may know, school budgets across the country are being cut, and a recent Bounty survey found that 71% of teachers report bringing cleaning and learning supplies from home, and are each spending an average of $462 a year for their classrooms out of their own pockets. So, what can parents do to help ease teachers’ financial burdens? School Family Media is partnering with Bounty to launch TeacherWishList.com, a new, free service that provides an opportunity for parents to give teachers in their communities the essential supplies they need for the classroom. To find out more about TeacherWishList.com and to check out the engaging chatter about teachers’ spending visit www.Facebook.com/Bounty. Please contact Kelsey Bailey at MSL if you have any questions about TeacherWishList.com or would like additional registration information to share with teachers in your community. She can be reached at Kelsey.Bailey@mslgroup.com or 646-557-7287.